£29 Off LEGOLAND Annual Pass at LEGOLAND Windsor - Don't Miss Out! At £60pp, this great deal gives exclusive discounts and entry on all open days*. Premium Merlin Annual Pass from £189pp at LEGOLAND Windsor This pass gives all the amazing benefits of the standard pass, as well as free car parking at Theme Parks and Warwick Castle! Standard Merlin Annual Pass from £139pp at LEGOLAND Windsor As well as giving entry to 32 amazing attractions across the country, this pass entitles the holder to exclusive discounts on overnight stays, up to 20% off food and retail, and discounted entry for family and friends! £12 Off LEGOLAND Saver Annual Pass at LEGOLAND Windsor Get a year's entry on all Saver Dates and exclusive discounts (including parking) for just £47pp! With over 50 rides and attractions to choose from, LEGO comes to life at LEGOLAND Windsor, making it one of the most popular children’s theme park and holiday destinations in the UK. With plenty to do for all the family, from flying through the treetops to escape the dragons or diving on a magical underwater adventure in a Submarine Voyage, LEGOLAND Windsor is the home of adventures that your little ones will never forget. 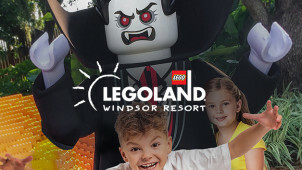 With your LEGOLAND Windsor vouchers, you can enjoy all of the best rides and attractions that the park has to offer, including the DUPLO Train, Jolly Rocker, Laser Raiders, LEGO City Driving School, Pirate Falls Treasure Chest, Space Tower, and the Spinning Spiders to name just a few. Along with their great range of rides, other attractions are available for all the family such as the Climbing Wall, Drench Towers, Brickville, Imagination Factory, Model Making Studio, Remote Control Boats, and much, much more for your family to see and do. With plenty of restaurants and food available, you'll be able to make a day of it — and even longer if you stay in the Legoland Hotel! LEGOLAND Windsor is part of Merlin Entertainments Group, which run 110 attractions in over 20 countries worldwide. With lots to offer for families and kids between the ages of 3 and 12, you’re sure to have a great adventure during your stay at LEGOLAND Windsor. How do I use my LEGOLAND voucher code? For unlimited fun all year round, why not treat your family to a LEGOLAND Windsor Annual Pass? Not only will you be able to visit the park as many times as you’d like throughout the year, you can also save money! When does LEGOLAND Windsor open? LEGOLAND Windsor is open at varying times of the year, depending on the season. The park is expected to re-open in March 2017, and you can find more details about opening days and times on their website. How much is car parking at LEGOLAND Windsor? Car parking at LEGOLAND Windsor costs £6 and you can pre-book your parking tickets online. Alternatively, you can purchase car park tickets from the Guest Services or Ticket Booths located throughout the park on the day of your visit. LEGOLAND Windsor offer a range of facilities to ensure that you have a safe and comfortable visit or stay. Locker rentals are available to keep your belongings safe, and first aiders are on hand for any mishaps. For more information, click here. Certain rides and attractions are subject to height and/or age restrictions. All children under 6 must be supervised by an adult. You can find the park opening hours online. A magical world built of LEGO, LEGOLAND Windsor is a theme park resort like no other and an unmissable summer day out. With many inspiring creations from mythical creatures to miniature towns made purely from tiny blocks of LEGO, you can have hours of fun remembering your favourite childhood memories and creating new ones with your kids. With LEGOLAND voucher codes, you'll be able to save on a great day out in the holidays, on weekends or half term! With access to over 50 rides and attractions, you'll be able to unveil the magic and become the next master builder! How do I use my LEGOLAND promotional code? The UK’s favourite kid’s theme park, LEGOLAND Windsor doesn’t just offer one of the most fun-filled days out in the South of England, there’s also the opportunity to stay for longer and enjoy the huge range of attractions even more. At the LEGOLAND hotel, guests can stay for as long as they’d like, with a range of LEGO-themed decorations to make sure that your little ones have the best sleepover ever. And, if you’re visiting for a special celebration, you can find birthday packages available too. Get great offers like 2 for 1 on entry and discounted family tickets when you book your day passes in advance online. You'll be able to skip the queue and make sure you've got plenty of time to experience all the fun at LEGOLAND Windsor. Just use our LEGOLAND discount codes online to save, and get ready to explore an amazing world like no other! There's no summer's day like a summer's day at LEGOLAND!